The best $199 ever spent? But I walk past billboards every day, buses and taxis drive past me with adverts emblazoned across them whenever I step out of the house. I see them at shops, the cinema, in stairwells, on the back of public toilet doors. The internet is rife with them too, and I even get them delivered to my inbox hidden amongst other content. 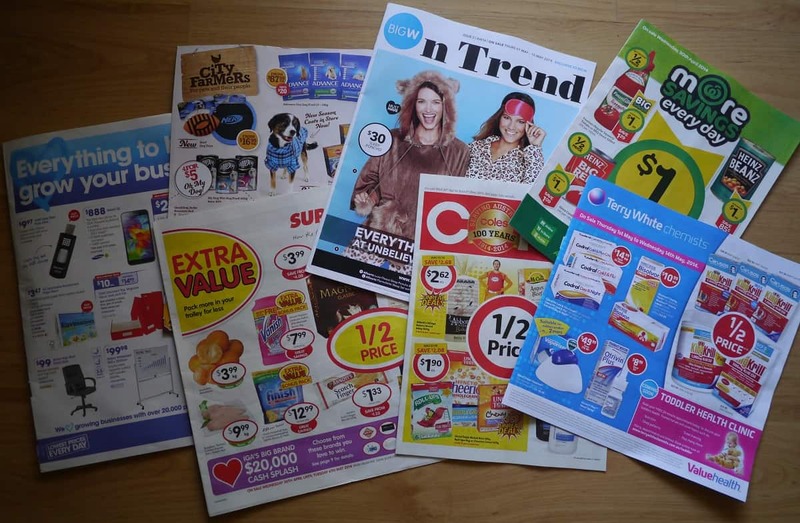 Avoiding catalogues and brochures (both printed and electronic) is one way I avoid advertising exposure. These adverts are more dangerous – not only do they try to make you desire something, but they tell you the price and where to buy it too! If we do get any through our mailbox, they go straight in the recycling ( and I curse the fact I still haven’t got round to putting a “no advertising material accepted” sticker on the box). If I don’t know what this season’s hot look or colour is, I don’t need to worry about whether or not I conform (which, no doubt, I don’t). It’s unlikely anyone else does either. Advertising works by making us feel inadequate; that’s what sells stuff. Let’s face it, these catalogues know how to get to our hearts, with their gorgeous models and flattering photography, and beautiful, clever and quirky products. It isn’t easy to just look and feel nothing. The mind starts to wander. Maybe my life would be better if I purchased a blue-and-white stripy themed dinner service. With the matching stripy napkins. So classic, and the nautical theme is just so…in! Hmmm. How ridiculous. Really. A box made of plywood (or is the fact it’s called the Plyo Box a strange coincidence?) that costs $199. Do these fitness types really need such a box? Won’t the stairs do? Or a sturdy chair? Or a wall? For the man who has everything…everything, that is, except common sense? I was thinking about this today when I was cutting up some crackers I’d made. I was using a knife, and I was thinking about pizza cutters, and how unnecessary they are – unless perhaps, you run a pizza shop. I used to have a pizza cutter, many years ago, and I used it on the few occasions that I ate pizza, until it broke. Then I had to cut my pizza with a knife. I’m going to offer you some wisdom here, and I come from a place of experience – cutting your pizza with a knife does not affect your enjoyment of eating said pizza. A pizza cutter does not increase your happiness (but it will probably piss you off when it breaks). Profound, huh?! My knife, by the way, is still going. That box and the pizza cutter aren’t actually so dissimilar, I realised, except one costs $199 and one costs $9. Both are completely unnecessary, yet price makes a huge difference to our perception: it’s a lot harder to justify spending $199 than to is to spend $9! What if we didn’t consider price at all – we only considered if something was necessary or unnecessary? Any catalogues, brochures and flyers that you do receive, throw straight in the recycling. If you watch TV, try to avoid the ad breaks. If there’s too many, simply turn the sound off. It’s amazing how much less notice you take if you can’t hear them. Try it! Unsubscribe from retailer newsletters, or anything else that tries to sell you stuff too frequently. You really won’t miss anything. 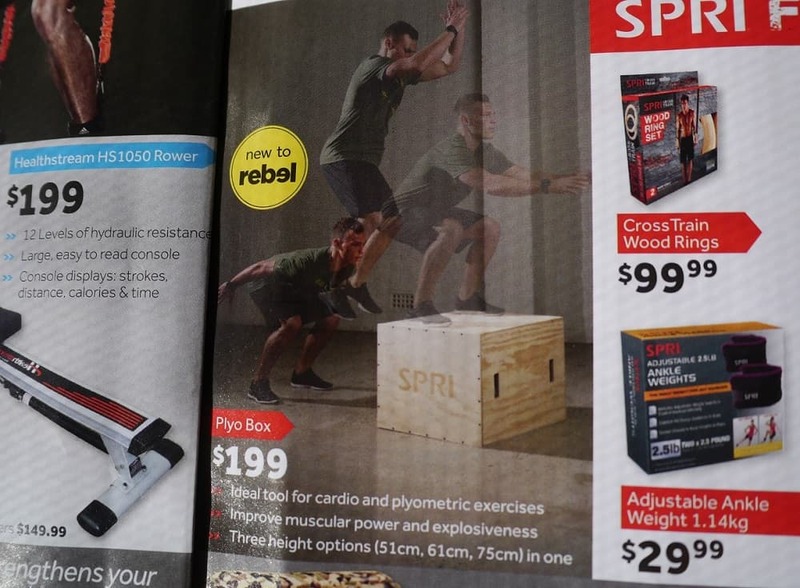 Next time you see an advert and feel yourself getting drawn in, just remember the Plyo box. Is it really going to be the best $199 you’ve ever spent? Tell me what you think! Do you have any tips for avoiding advertising? Do you find it easy or are you swept up by the clever marketing tricks? Can you stick to only necessary purchases? Do you think I’ve got it wrong, and clearly the Plyo box is the best invention you’ve ever seen?! I’d love you to leave your thoughts in the comments! 25 Responses to The best $199 ever spent? I hope you remember to get your no junk mail sticker up. Here most junk mail is considered bulk mailing and we can’t stop it no matter what notice we put up. I use knives for just about everything and own a total of 4. A large “bread knife” that works great for cutting up cardboard along with a cheap pairing knife (for when a second person is helping with prepping food) a pairing knife that belonged to my grandparents and an old steak knife that works great for cutting onions and celery. Isn’t it ridiculous?! My boyfriend thinks it is as well, don’t worry! He actually googled it to see if it was a real thing! Apparently it is! Maybe you could set up a rival company and sell yours for $150?! Prices are definitely higher here, but I have no idea how much pizza cutters cost! Yes Lois, I will get a junk mail sticker : ) Now i have all you peeps to be on my case and make me feel guilty…which is a good thing, as it needs to happen. We have three knives, including a bread knife. We had four, but one got mixed up in someone else’s stuff after a picnic. Oh, and the cheese knife – except that is heading for the charity shop before we move! I have to laugh at some of the crazy things out there for sale, a cheese knife what’s wrong with a regular paring knife? We even have plastic banana cutters for sale. Like a banana is hard to slice. The banana cutter would be harder to clean than a knife even. But you can’t turn the paring knife upside down and pick up pieces of cheese with the pronged bit! A useful tool for all those cheese dinner parties we have?! Just kidding. It’s in the charity shop bag – it’s not moving home with us! PS the banana cutter sounds less useful than the cheese knife! There are so very crazy things out there – I just hope there isn’t demand to match! Isn’t that horrid? When I saw it in the store all I could think was how hard it would be to get that thing clean. Of course the next I wondered how many would even use it over a knife. radio national helps with ads on radio! no telly solves that one – I am amazed at how much more I click into the shopping frenzy when I go away and see one! except for the essentials of life I go 24 hours before I buy something and I also tell Tim . . .we end up discussing it and seeing if there are alternatives. It took me 12 months to buy my workboots ( tim accidentally gave my lsst pair to good sammies) as I kept thinking I would find them in an op shop. I ended up buying them in Esperance as I found an independent country goods store where I met the owners ( and their daughter! But Hulbert street does own a pizza cutter. One. That we share. It lives in the cupboard at Cheries and if you borrow it for a pizza party at home you write it down. I bought an expensive good quality one and four odd years later it is still sharp. But then it kind of goes with the street owned pizza oven . . .
Love your work Lindsay – keep it coming! Ah yes, true – ad-free radio! I love the Hulbert St pizza cutter story! If only more communities did stuff like this! Not with pizza cutters (although that is awesome) but bigger stuff. Why does every household need a printer, and a lawn mower, and a wheelbarrow?! I avoid going to ‘parties’. No more pampered chef, Tupperware, etc etc for me. Quite sad really because I enjoyed the social part of it. The cheese and wine, the yummy cake, the girly chats but HATE the ‘you can’t live without this gadget’ thing. Good point. It’s a shame that people need an excuse to get together and have fun – and worse that the excuse is shopping! Maybe you need to organise your own “party” with all the things you do like and no shopping attached?! Yep I used normal knives for my cheese and wine night recently. No one said a thing. Admittedly they didn’t fit as well on the smaller plate, but again, no one cared. I think gifts is an interesting one – I keep meaning to write a blog post on it. I think that just as we don’t want our friends and family to force our ideals on us, we need to be mindful not to force ours on them. I think it’s more important to choose something that your mother will like and will thank you for than to get on your high horse and buy her a charity donation for a goat, if that’s not her thing! So if you’re mum would like a cushion, and you’re happy buying it, then that sounds like a perfect situation! I always get my mum flowers, although I’ve also got her redcurrant and blackcurrant plants in the past for the garden! I think in England most people buy flowers for Mother’s Day. I look forward to your post, should you ever get to it! I’m glad the goat card wasn’t from you! I find it interesting that your mum prefers “things” to experiences; I guess I assume that if the experience is a good one that the receiver would always find it better than a “thing”! Which, when I think about it, doesn’t really make sense. I try to do experiences too, or make food for people who live close by (doesn’t quite work with overseas gifts!). I’m still finding my way with gifts and the rules I want to stick to! That box is utterly hilarious. Can’t quite believe it exists! I manage to avoid a lot of advertising by having no tv, listening to the BBC radio, not having too many magazines in the house – only ones I love – and listening to my inner voice, the one that really lets me examine whether I really and truly need to have something in my life. I’ve ignored that voice for many years, but now it’s flourishing and I’m living a better life for it. I’m intrigued…which magazines do you love? My boyfriend is quite keen on magazines and is constantly requesting them from the library. I’m not really a magazine reader – I think the adverts put me off! Seriously, I feel like even the green ones are trying to sell me things… which they are, of course. I love Opinel knives! Useful for everything! I love quite a few magazines – it’s an old addition. In the past I’ve had everything from Vogue to Farmers’ Weekly! These days I like ‘Kinfolk’ (even though they’re definitely selling a lifestyle, they’re advert free) and ‘Hole & Corner’. I also find Permaculture magazine to be really optimistic, and there’s a couple called Sidetracked and Ernest, which are both about adventurous living which I am interested in. Basically I like magazines that focus on ‘doing’ rather than ‘having’ stuff! Hi, this comment is rather late but I’m currently making my way through your wonderful blog. The ply in the box refers to plyometrics (“jump training”) and such a box is indeed useful for the exercises but you can of course use other materials.